Looking for ways to clean, reduce, purge and declutter your home? 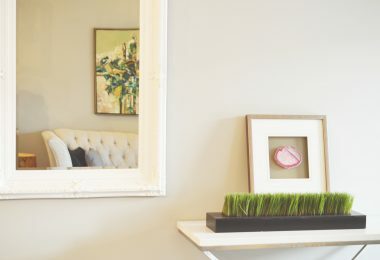 You will love following these decluttering tips to organize every room in your home – your closet, kitchen, living room, bedrooms, garage, office and more – and keep it that way! Ahhh new year, new you? Or maybe new house? How about a clean, clutter free house? The fresh start of a new year has me wanting to start fresh in every area of my life. I am working on important relationships, getting my daily diet and exercise right, and now, I am ready to go all in at home, too! While I can’t purchase a new home or buy all now furniture and decor, I CAN clean, organize and declutter the place I spend lots of my time living and working: my home. I seriously cannot stand looking at a mess, so I’ve put together a bunch of organizing tips to declutter your home – I mean every single room of your house. 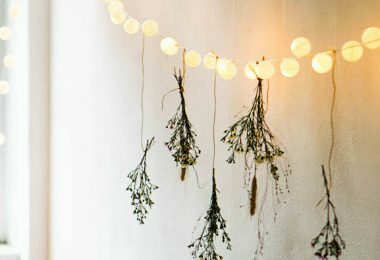 Take it slow, a day at a time can transform your home from mess to YES! 1. Rummage through the area, put away extra items and throw away trash and unused items. 2. 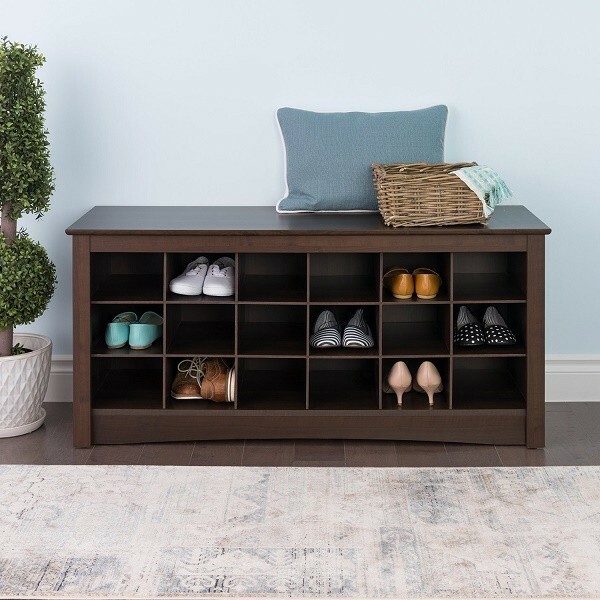 Create an area where you’re able to sit and neatly store shoes, this shoe cubby storage bench looks like a great foyer addition! 3. Hang one of these entry way and foyer coat organizers on the wall to make it easy to hang backpacks, jackets, keys and other items. 4. Use large woven baskets to store other items, such as umbrellas, scarves, books, the dog’s leash, and more. 5. Open up drawers and cupboards and get rid of expired foods, broken dishes, food storage containers missing lids, and anything you will no longer use. 6. Remove everything from the refrigerator and freezer and disinfect the interior. As you put groceries back in, trash anything that’s old, expired or won’t be used. 7. Wipe down your cabinets, and clean your oven and microwave. Nothing worse than dirty doors, handles and knobs from food splashes over the past year. 8. Clear the kitchen counter and sink and deep clean all parts, corners, nooks and crannies. 9. Keep counters clutter free by storing extra items somewhere else. This could be the cabinet above your refrigerator, the drawer under your oven, or even on the wall with these kitchen wall shelves that can hold a multitude of things! 10. Be honest: what has been collecting dust? Dishes? Tupperware? Broken utensils? Warped pots and pans? That oh so cute holiday coffee cup set that you’ve been itching to use for the past 5 years and haven’t gotten around to it? Get rid of it all! 11. Store appliances that you rarely use. Blenders, coffee makers, mixers, slow cookers, juicers, seasonal items, etc – they’re huge and can be an eye sore. 12. Make extra space in your cabinets by using stackable shelves and organizers. I use these expandable kitchen cabinet shelves in my cabinets for my glasses and cups to double my storage space and organize my cabinets. I also love this stackable can rack organizer, it fits up to 36 cans! 13. Open up your closet, dresser drawers and cabinets, and get rid of everything that is ripped, stained, over worn, and doesn’t fit. This includes socks, undies, bras and other clothes that you look at and think, “I might wear this one day,” and also the items that you’ve once used for work or certain situations that you’re no longer in. This is one of the most effective ways how to declutter your home, you’ll have space for everything! 14. Store seasonal clothing away in boxes so it’s out of sight until you need it. 15. I love this idea: Turn all of your hangers backwards in the closet. As you wear clothes, turn them around the right way, and at the end of the year, you’ll know what you never wear by the hangers that are still backwards. Get rid of those things! 16. In some cases, you might just need a simple book case, storage unit or storage ottoman to put all of the little eye sores with no place to go, out of sight! 17. Clean under the bed. Face it, you never do this, so now is the time! 18. Use the space under your bed for storage. This is great for those seasonal clothes, extra shoes, and other items that you rarely use. We have this underbed wheeled storage box with lid and use it to store winter coats, thermals, and snow and rain boots in the off season. Also, here’s an underbed shoe organizer. 19. Put a dirty clothes hamper inside of your closet. 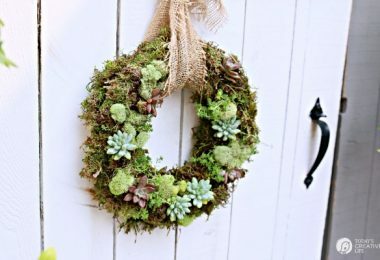 Super easy eye sore fix to declutter your home! 20. Invest in a tie organizer, scarf organizer, purse organizer, and general closet shelves. They’re very helpful for organizing the odds and ends. I have a hanging closet shelf organizer that has shoes, belts and other random things in it. 21. Remove all items from counter tops, toilet, bath tub and shower, and scrub those babies really good. Also, clean mirrors, cabinets, surfaces and other stationary items in your bathroom. 22. Place all bath towels, bath mats, scrubbers and any other washable items into the washing machine. 23. Inventory all items and determine what should be kept, and what should be trashed: razors, tooth brushes, hair brushes, combs and ties, expired medicines, pills, make up, lotions, soaps, trial sized items, samples, kids bath toys and other personal care items. 24. Use plastic kitchen utensil holders to organize bathroom drawers, works like a charm! 25. Over the toilet storage cabinets work SO WELL. 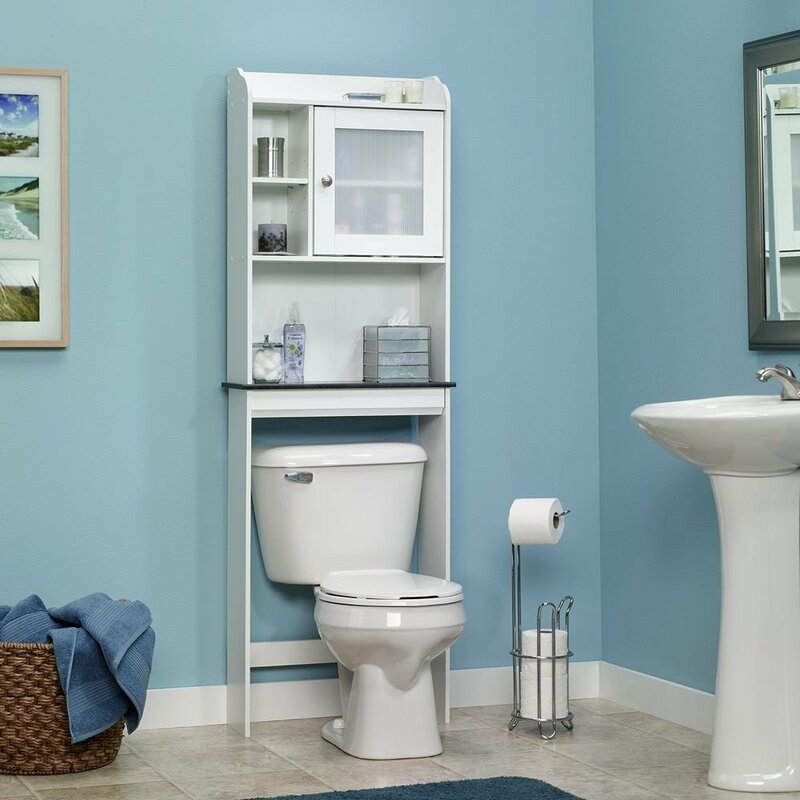 If you have space, consider adding a large woven basket to the bathroom for dirty clothes and other items that need to be removed from the area. 26. Remember those stackable shelves that we used in the kitchen? These also work to make more space under the bathroom sink! 27. Use mason jars to store cotton balls, Q-tips, make up, nail polish and other decorative items. You can leave them right out on the counter top and they look like they’re part of your decor scheme! 28. Move couches and other furniture and clean/vacuum under them. You’d be surprised about what makes their way under there! 29. Clear tables, counters, book cases, TV stands, wall and storage units and purge everything, getting rid of all of the extras. 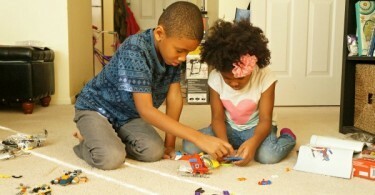 Make different piles for each person in your household to put away or trash. Everything should have a specific spot. 30. Wipe down every single surface listed above in number 29, including window sills, fans, and any other area that needs refreshing. 31. Add an “everything basket” to the corner of the living room and fill it with the items that need to be cleaned up. Once per week, each person should go through the basket and take their respective items to be put away! It can also be used to store throws and small pillows when not in use to declutter your home. 32. Consider purchasing new furniture pieces that serve as functional storage. 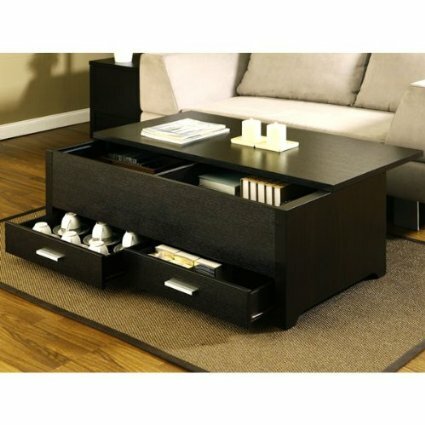 Storage ottomans and coffee tables with drawers are great for putting stuff in, also serving as foot and beverage rests, and these storage units with baskets look like nice decorations and hide whatever items you might need to keep in them. 33. Clean all surfaces and sides of your washer and dryer and sanitize the floors. 34. Carefully move the washer and dryer and sweep the lint and debris out from behind them. You may have to unplug them both and turn off the water. Safety first! 35. Make use of all of your wall space by installing floating wall shelves and adding woven baskets for storage. This way, you can hide detergent, towels, dryer sheets and other items, a big way how to declutter your home! 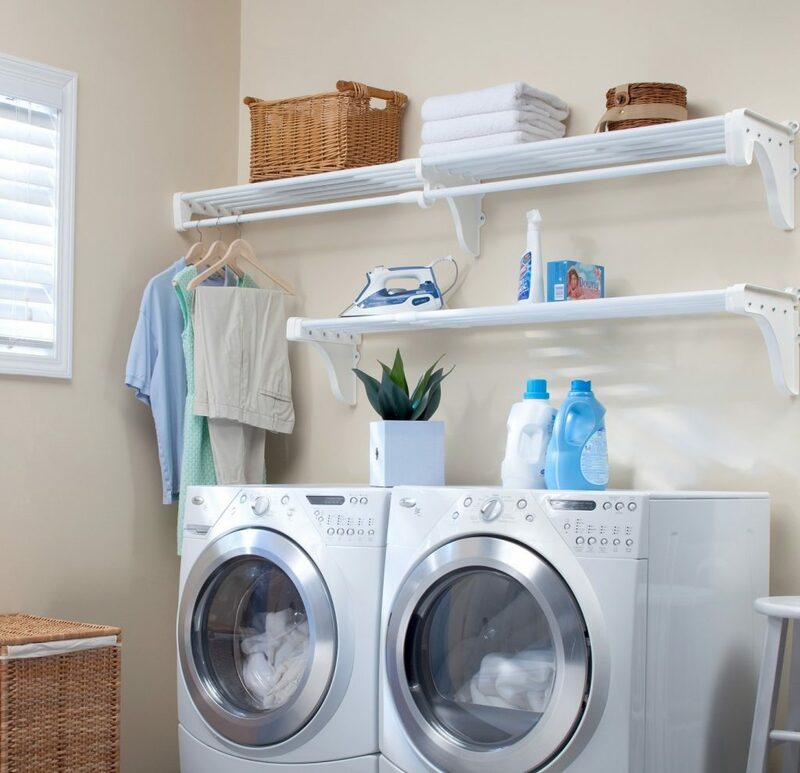 This laundry room storage shelving kit is gold! 36. Add a small trash bin in an inconspicuous place for items that need to be thrown away. I always have tags, lint, used dryer sheets and other little things that need to be tossed. 37. Begin by creating piles of which you’ll place all items: keep, sell, trash. When choosing items to keep, toss those items that you haven’t used in over a year. 38. Sweep and mop the whole garage or basement floor, wipe down counters dust surfaces, and get the upper and lower corners with a broom to remove cobwebs. 39. For the stuff you are keeping, install wall storage unit, if you don’t already have one. There are fully wall mountable ones, or you can get a couple of these heavy duty industrial steel shelving units and sit the next to each other right against the wall. This is a great, sturdy place to put tools, paint, wood, boxes, seasonal, car repair items and more of what’s sitting around on the floor. Lawn mowers, bikes, ladders and other large items should sit on the floor and the rest should be properly stowed and organized. 40. Need more storage space? 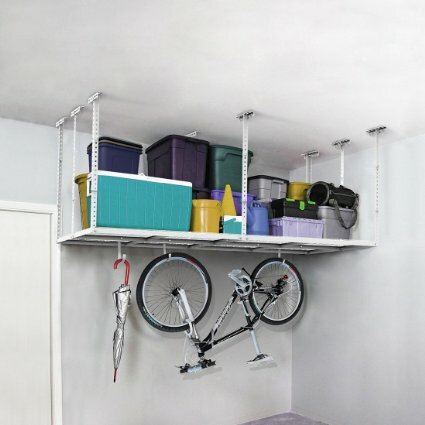 Consider adding an overhead garage storage rack unit that hangs on the ceiling. You can finally park your car in the garage, and you probably have space to add the treadmill in the basement that you’ve always wanted to! 41. Go through outdoor sheds, backyard toys, tools, equipment and get rid of anything that is broken, moldy, or that you haven’t and will not use this year. Be honest with yourself! 42. Organize gardening tools and supplies with this garden tool storage tower (this can also go in the garage). Messy gardening tools are the worst, so the storage tower is perfect to help you learn how to declutter your home. 43. Thoroughly clean and repair all outdoor furniture and rugs, sweep concrete areas and remove dead plants. 44. Test water hose to be sure there are no holes, cracks and splits where water is wasted. Replace if necessary. 45. Store outdoor toys, hoses, and other items in this resin outdoor deck storage box. It’s water proof and great for all weather to preserve your stuff. 46. Have a pool? Make sure you’re using a regular maintenance schedule to prevent it from changing colors on you! 47. Clear off the entire top of your desk, under it, inside drawers and cabinets, and give everything a home. No spot, it goes in the trash! Tie up cords and hide behind your desk, I love the electronic cord storage ideas here! 48. A great way how to declutter your home office is to go through files and do a giant purge. You know what you need to hang on to and what is extremely old. Tax returns should be kept for 7 years, so the old ones may go! Be sure that you shred important documents before throwing them away. 49. Out of storage space? Need to leave yourself some desk space? Keep your eyes peeled for desk organization solutions for the items you use often (pencils and pens, stapler, tape, note pad, scissors, post-its, etc), and add free standing office shelves or add floating wall shelves with bins, dividers or storage baskets for those items that you use much less. 50. Make sure you sweep, vacuum, mop, all floors, wipe down baseboards, and dust off fans and window sills. What did I miss? How do you clean, purge and declutter your home? Thanks for these great tips! So love it! This will definitely serve as my guide! I have researched through a lot of pins to help me organize and declutter. I am an organized person so a lot of them were lacking for me. 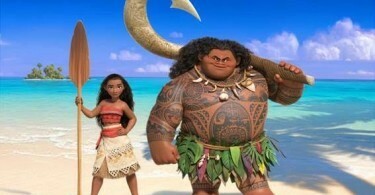 But this one is great! Is a great list that you could do one a day or week and leaves enough room for my own specifics. Thank you! Glad you like this list! I guess it depends upon how much time you have. I work full time, so I know for sure that I couldn’t complete one task per day. I would probably choose one area per week and go from there. Happy cleaning!